It's a Bird! It's a Plane! It's... a Fish?!? Take a pair of guitarists, one in monk's garb, the other in a sinister looking black frock. Add a drummer, with goatee, in a nun's outfit. Mix in a bassist and frontman donning a satin black and white polka dot shirt. 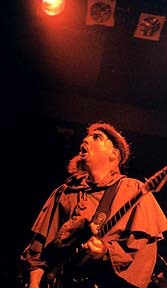 Les Claypool could have been a bank manager in an institution of the bizarre -- small wonder Claypool has dubbed his backup band the Holy Mackerel. Playing to a packed house at the Town Pump, Claypool and his comrades provided an excellent show full of funky beats and sly stage presence. Even without the costumes, clearly the band's charisma would have shone in spades at the mid-sized venue. On sabbatical from Primus and touring to support his side project CD, Highball with the Devil, Claypool dispatched a quality set that seemed effortless in its delivery. Nicknamed "From the Corn" after the Corn Studio, Highball... started out with Claypool compiling demos that eventually took the shape of an album. Culling only three songs from the original batch, Claypool then enlisted the likes of Henry Rollins, Charlie Hunter and Joe Gore (Tom Waits/PJ Harvey guitarist) to round out what was to be his solo debut. While not containing that cast of musicians on tour, Claypool's band was extremely tight and, more importantly, considering the nature of the material, versatile. 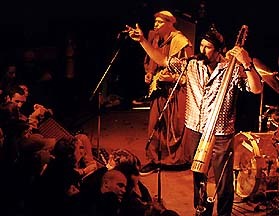 With Claypool anchoring the band on bass, the sound was heavy on bottom and contained various elements from Captain Beefheart to early Talking Heads. Drummer Jay Lane was superb behind his kit. Whether adding subtle dashes to the rhythm or converting to powerhouse fireworks, Lane garnered due credit from the fairly young crowd and was one of the many highlights of the evening. 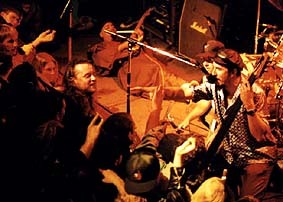 Harder edged than on the disc, Claypool and the Holy Mackerel sailed through most of Highball with the Devil's eclectic crop of tunes with such efficiency that it was almost a twisted suite from the bowels of the earth. After a brief introductory incantation in praise of the Holy Mackerel, the quartet kicked into the funky song of the same title. Moving to the CD's title track, Claypool slapped and bounced all over the fretboard of his bass in a cool P-Funk fashion. 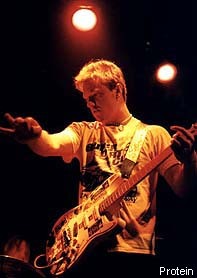 Guitarist Mark Haggard, who also led the warmup band, MIRV, played snakebite leads in perfect complement to Claypool's slinky songs. On "Hendershot," Claypool's bass bubbled over the melody as Lane punctuated the rhythm in perfect time. The band stretched out on the quirky "Cohibas Esplenditos," allowing Haggard to check out the various pedals at his disposal to good effect while Lane spiked the beat with cruise missile accuracy. While Claypool may not be in cahoots with the devil, the way the group played the band may have struck some sort of deal to get so down and funky. Tres cool. Opening the show were San Fran oddballs, MIRV. Like a pinball machine gone crazy, the quartet barbecued every style they dismembered to smoky bits. From swamp to country to a brief Italian aria, MIRV poked fun with fine-tuned agility. The dust-up really gathered with a handful of surf numbers: in particular. "Rev It Up" and "Feeding Time on Monkey Island" prickled with down home country cheese. Somewhat Ween's evil-twin, the band rocked the Pump and got the venue hopping, which is rare for openers, considering Vancouver's fickle audiences. On the other hand, Protein were a dud. The San Francisco trio played a bland set of retro-sounding numbers that barely registered on the originality meter. Ironically the best song of their short set was a cover of Gary Numan's "Cars." Generic to the extreme.